Mrs Folasade Adesalu, a member of Winners Chapel Ikorodu branch has shared her story of fruitfulness and her struggle with infertility after being diagnosed with endometrosis, blocked Fallopian tubes, fibroid, Ovarian Cyst, and her husband, a low sperm count. She even stated that even having children with IVF was negative. “I got married to my husband Olumuyiwa in December 2006. My problems started before I got married. I used to have irregular periods and a very heavy menstrual flow with lots of blood clot right from my secondary school days. I was taken to the hospital, got treated with antibiotics and a whole lot of other medications, though it helped a little but I was not cured completely. I started getting anxious but not worried that I wasn’t pregnant a year into my marriage and that was the beginning of my journey to several doctors. I consulted various gyneacologist who gave different diagnosis. In 2007, I was diagnosed with blocked fallopian tubes. After carrying out the HSG (fallopian tube test), the doctor then inferred that he would need to get the tubes flushed perhaps the blockage could be removed. He did carryout the procedure, a very painful experience! After 6 months, still no pregnancy, I moved to another hospital. The new gyneacologist had to repeat the entire fertility test again and the ever painful HSG test. My husband then joined me to run test after so much persuasion and pleading. We were so taken aback when the doctor came up with another report that I had a fibroid, an ovarian cyst and blocked fallopian tubes; and my husband- low sperm counts. It’s like we were given a death sentence. It was overwhelming!!! He then advised that we should go and try IVF (ASSISTED CONCEPTION) as there was no means of natural conception due to all the fertility issues that we had. In 2009, my husband and I agreed to give the IVF a try. We were disappointed because it came out negative. At this point I didn’t know what to do again than to continue asking God for mercy and divine healing. I was already getting pressure from family and my in-laws. I got all sorts of insults and negative talk in family gatherings. Sometimes I wept secretly and pretended that everything was alright. In 2010, we attended a church service (Covenant day of fruitfulness) at Winner’s chapel where Bishop Oyedepo was ministering on fruitfulness. He said ‘fruitfulness is a commandment that all mankind and every living thing should fulfill’ Genesis 8:17. He said ‘‘you must be fruitful irrespective of the obstacles or difficulties, because the almighty God has commanded it’’. I keyed into the ministrations and at that point I was determined to fulfill that commandment despite any medical setbacks. As I continued to believe God and trusting him for a miracle, I suddenly fell so sick, experiencing so much pain around my right pelvis. I visited the hospital again. After series of test and intrauterine pelvis scan, I was diagnosed with PCOS (polycystic ovarian syndrome) and endometriosis (a disorder in which the tissue that forms the lining of the uterus grows outside the uterine cavity). In my own case a large cyst (tissue) was growing on my ovary filled with fluid (dark red blood). As days and weeks passes, the cyst became bigger and bigger along with an excruciating pain. The doctor then advised that the cyst must be punctured and the fluid drains out if I must be relieved of the pains. He warns that it was just a temporary solution because as long as I menstruate, the cyst will continue to draw blood to itself. So every month, for 4 consecutive months my ovary was being punctured and more than a liter of blood was being drained out every time. My sister, the experience was so overwhelming, the pains was so intense. I couldn’t pray again. I was drained spiritually, physically, financially, emotionally. I became angry with GOD and my spouse. I was wearied, but I didn’t give up. Then in 2011 July, I heard about healing school of Christ embassy through my sister in-law, Funke who was a member of the church. I decided to attend. At this juncture, I knew it’s only God that could heal me of all the ailments as endometriosis has no cure. It could only be managed. From the first day of the program, I received my healing because my faith and my spirit man were awakened by the teachings from the word of GOD. I laid my entire fertility problem on the altar of God and was ready to be set free. On the last day of the healing school, Pastor Chris was ministering; he approached me and touched my side where I had the big cyst. I felt a chilly sensation throughout my body. Right then and there, I knew my healing was absolute and complete. I went back home with so much faith and I continued with my faith confessions, listening to messages from men Of God and preoccupied my mind with meditations and supplications. Reading and listening to testimonies of others really helped my faith and I became absolutely sure that if GOD could answer couples that had similar fertility issues as ours, we too can have a testimony. In October 2011, my husband and I travelled to Canada for his sister’s 40th birthday celebrations. We then attended a program with them in their church at RCCG BRAMPTON. In the middle of the ministration, the guest minister just pointed at me and asked me to sit on his chair and he then gave me his jacket to put on. I could not understand what was going on. He then prophesied that by this time next year (2012) I will be carrying a son(s) and his name shall be called Paul after his name. I RECEIVED IT, GRABBED IT and RAN with it. That became my strength, my watchword and I immediately named the twins. I pasted the names on my wall in the bedroom. Every morning and night, i will call them forth to manifest. I started calling myself “Iya ibeji”. My prayer point became ”God confirm the word of your servants and perform the prophesy that had come forth into my life and my marriage” Isaiah 44:26. After which I will give him praise for answered prayers. Then the devil brought back its ugly head again trying to challenge my healing (I knew it was a test of faith). The pain of endometriosis returned and this time the pain was indescribable. At a time I passed out on the hospitable table where I was undergoing a procedure. It took divine intervention for me to return back to life. So the chief gynaecologist advised that I should travel to India for a major surgery where the ovaries will be removed before it will degenerate to ovarian cancer. I cannot lie, I was shaken but I still believe in creative miracles (a book written by Catherine Kummer). Alas!!! the blood test came out positive. I was diagnosed PREGNANT for the first time in 6yrs. I marveled, I couldn’t believe it. I ran to another lab to reconfirm the result, it was same. Our JOY knew no bound. WE WERE GRATEFUL. Even my doctors could not explain the pregnancy. One of the doctor even call it “a chemical pregnancy”. they said it’s not a true pregnancy, the fetus will not grow.. bla… bla…bla….I TOLD THEM I WILL COME BACK IN 9 MONTHS WITH TWIN BABIES(Because the Lord had said it), even though I haven’t done the scan to confirm it, but I was convinced I was having twins. The 9 months journey was not an easy one. The devil struck again, trying to abort the pregnancy prematurely. At 12 weeks of the pregnancy, I had a ruptured and twisted ovary (the pains hennn!!! was out of this world). 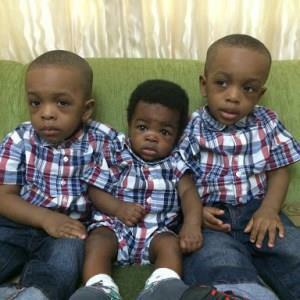 The fibroid was growing bigger and was contending for space with the twins. The doctor had to perform cervical cerclage (tying of my cervix) to avoid the pregnancy from being pushed out. I was placed on an injection every 6 hrs just to make the lining of my womb thickened to hold the pregnancy and I was placed on bed rest for two months. When the pain of the ruptured cyst was becoming too much, my husband became scared. He had to tell the doctors to abort the pregnancy and removed the ruptured ovary. He said he still needs me alive and we could go for adoption. I refused, I knew what God had said, that he will do what he says he will do. He is not a man that he should lie, neither the son of man that he should repent. Numbers 23:19. I was fully persuaded that He had promised he was also able to perform Romans 8:21. I also held on to God word that says I will not cast my young or miscarry Exodus 23:26. He that has started this journey will surely complete and perfect it, Philippians 1:6. These were my confessions throughout the turbulent period and the Lord honoured my faith. At 36 weeks 5days, 4 days to our 6th year wedding anniversary, the Lord delivered me of a beautiful TWIN BABY BOYS, HALLELUYAH! PRAISE THE LORD. The delivery was quick, in less than 7 minutes the guys (TOLUWANI PETER& TOLUWALASE PAUL) were out and I was back on my feet in few hours. Each one was weighing about 2.5kg. 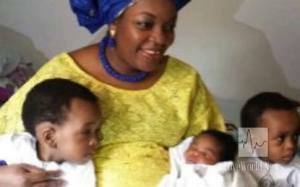 The doctors marveled on how I was able to carry twins with the whole baggage of large fibroid and blasted ovary. And when the Lord turns back the captivity of Zion, we were like them that dream dreams. PSALM 126:1. It was barely 6 months after I delivered the twins that I discovered I had conceived again. The pregnancy journey this time was smooth. I had no complications whatsoever but the delivery was tougher than the twins’, but to God be the glory I was delivered of another bouncing baby boy Toluwalore 17 MONTHS after the set of twin. To my greatest amazement, after Toluwalore PATRICK was delivered through a caesarian section, the doctors confirmed they could not see any fibroid nor blasted ovary. How??? I call it a creative miracle. Whatever my father has not planted, shall be uprooted Mathew 15:13. He made all doctors’ report null and void. He uprooted all ailments from the roots, gave me joy for ashes, and turned my darkness to light; HE turns my ridicule to miracle, AN ABSOLUTE MIRACLE. Haaaaaa..Jesus! faith! Faith!! Faith!! Thy faith has made thee whole woman!